Gaming is one of the cherished leisure activities. Online gaming has become popular all over the world and virtual games, as well as live games, draw unlimited viewership. Games shared in a network enables buddies to have great times and explore new trends in the world of entertainment. Ethernet cable is one of the necessary accessories in a Local Area Network (LAN) to connect computers to peripheral hardware. The quality and speed of cable LAN depend to a great extent on the fast and uninterrupted transmission of data between network components and computers. Remember that the network speed cannot be faster than the slowest component. Therefore, a router, switch box or a server may affect the overall performance. Amazon supplies a big collection of Ethernet cables made by different manufacturers. Cables have varying features and performance capabilities. Cables handle up to certain speeds of signals. The prices of ethernet cables remain favourable for every prospect according to their preference. If you have used your cable for long you may consider an upgrade for a crystal clear view on your screen. You will get all the details and prices of the reviewed top cables. Make the right choice for gaming and anticipate an encounter with a difference in 2019. Do you want to experience data transmission at lightning speeds? You have the answer right here. Mediabridge is a high-performance cable that is doing well in the Amazon shop with leading sales and numerous customer reviews. It is the best solution that you cannot let go of when you visit the online shop. 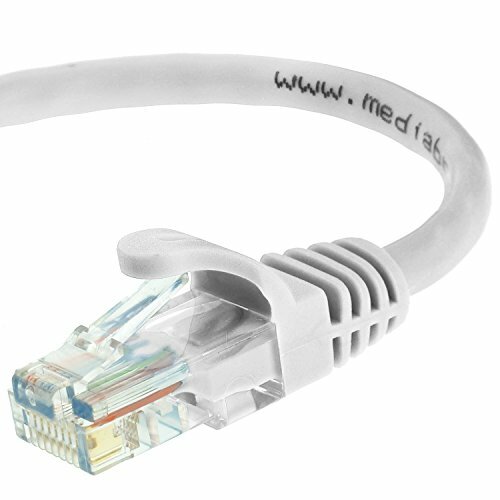 Mediabridge Ethernet Cable is a luxurious gold plated RJ45 stranded cable rated 550 MHz and with a conductor gauge of 24 AWG. This is the outstanding option for server applications, video surveillance, cloud computing, and online HD video streaming. It consists of 4 twisted pairs partitioned by PE cross insulation to protect against crosstalk. This is a lightweight cable – 1 pound and the package dimensions are 8.4 x 8.3 x 2.6 inches. It is verified by TIA/EIA 568-B.2 and UL listed. In fact, it exceeds Category 6 performance standards. The cable also complies with Voice over IP (VoIP) and Power over Ethernet (PoE). It will provide you with universal connectivity among computers and network components like switch boxes, routers, network attached storage (NAS) devices, network printers, PoE devices and VoIP phones. Mediabridge is a powerful asset for 10 Gigabit, 1 Gigabit, and Fast Ethernet networks facilitating LAN systems. Mediabridge guarantees you exceptional data transmission and negligible signal losses. Matein Cat6 Ethernet Cable is a competitive brand in the Amazon. It transmits data ten times faster than Cat5 models; to a speed of 1 Gigabit per second. It is a contemporary design product that consists of pure bare copper that is oxygen-free. 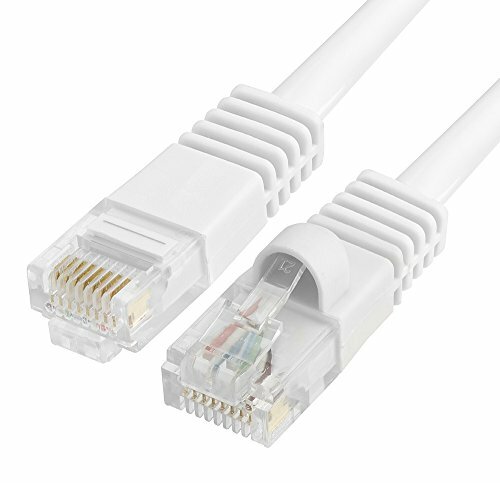 Matein Cat6 4-Pair UTP includes connector type RJ45 and the performance is up to 250 MHz. It is VoIP (Voice over IP), RoHS, and TIA/EIA 568-C.2 compliant. The cable construction features unshielded twisted pairs which enhance signal quality, minimise cross-talk, and improve data transmission. Matein cable is built in a safe and high-quality design that has passed the Fluke Test. The connectors RJ45 comprise of anti-corrosion 50-micron contacts plated with gold and it is resistant to wear. Enjoy flawless LAN connection for PS4, PS3, Xbox 360, Xbox One, modems, laptop, servers, printers, and switch boxes. The connectivity extends to VoIP phones, media players, and network storage devices. Matein Cat6 Ethernet is ideal for office and wired home networks. It is an impressive flat design that is fit for outdoor and indoor including hotel and public networks. The cable lines up easily against the wall. It weighs 8 ounces with dimensions 9.6 x 6.6 x 0.5 inches. 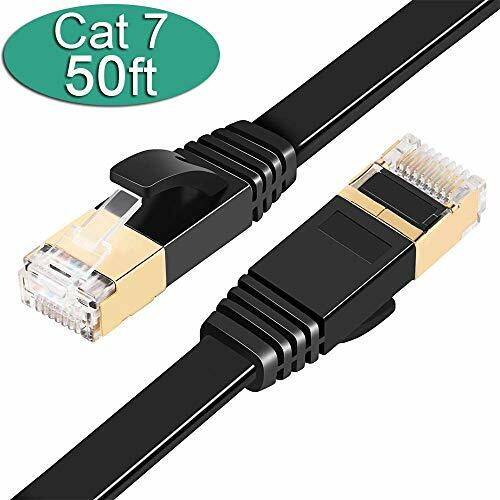 Buy Matein Cat6 Ethernet Cable to experience minimal noise, secure connection, and less interruption. Do you want to upgrade your office or home network with ultra-fast, secure, and dependable cable? KabelDirekt Cat6 Ethernet provides ultra-fast connectivity of 1 Gbps. Use this cable to replace the old malfunctioning models. The cable features oxygen-free wiring and corrosion-resistant structure to sustainably ensure that you get an optimum signal. The Snagless RJ45 connectors keep your data absolutely secure. KabelDirekt cable is flexible and thin hence you can install it in any position without affecting connectivity because it is not stiff. This cable guarantees you unrivalled durability and it is easy to install. Make your purchase now. Intelligent Class F Shielding Compatible with Cat 6 and Older Versions. Your search has come to an end! CableGeeker Cat 7 features a contemporary design with 8-wire stranded shielded copper. The cable performance is 600 MHz and the conductor gauge is 32 AWG. The connector is RJ45 and the contact plating comprises of 50-micron gold plate contact pins. The cable complies with TIA/EIA-568-B.2-10 standards. Choose your preferred length from 150 feet to 1.5 feet. And the quality? – Excellent premium quality; flat design. The structure consists of copper conductors, GND, PVC, and Aluminium foil. External EMI/RFI interruption and crosstalk are blocked by the gold plated RJ45 connector and an advanced Screen Shielded Twisted Pair (S/STP). Cable dimensions are 6 x 3.9 x 2.4 inches and it weighs 11.2 ounces. Performance is further enhanced by 100% oxygen-free bare copper conductor. CableGeeker is a presentable, flexible, ultra slim and anti-wear cable that will give your office or home a decent look. Buy this high-tech cable for excellent gaming in 2019. Jadaol is a perfect match for wired office and home networks. This cable provides universal connectivity for computers and all network components. The cable supports 250 MHz and it is ideal for 10 Gigabit Ethernet, Gigabit Ethernet, and Fast Ethernet. Jadaol Cat6 consists of a durable stranded construction of 100% bare copper. Copper has better tensile strength and conductivity than aluminium. It complies with UL Code 444 and serves efficiently with routers, Xbox 360, network printers, and network storage devices. The conductor gauge is 30 AWG and the contact plating is 50micron gold. This cable has passed the fluke test to ensure that it meets universal standards. 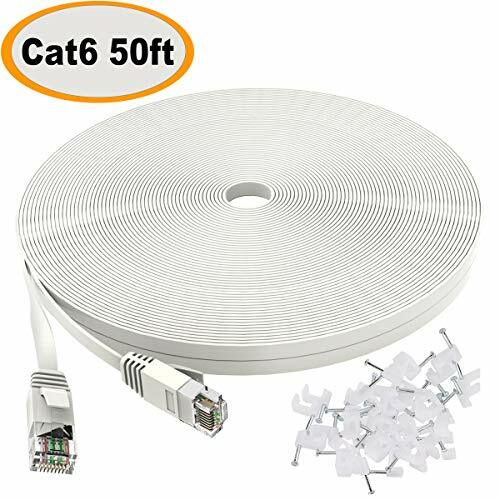 The package contains 1x Cat6 50 feet white cable and 15x cable clips. The item weighs 10.4 ounces and the dimensions are 3.5 x 3.5 x 0.4 inches. Order for Jadaol Cat 6 Ethernet Cable online and enjoy the gaming experience at your office or balcony. Absolute Networking Compatibility for Cat7, Cat6a, Cat6, Cat5e, and Cat5. Supports all computers and peripherals with RJ45 Jacks. Excellent Uninterrupted Speeds – 10 Gbps, 600 MHz. 4 STP copper wires with 8 gold contact pins enhance optimum performance and negligible interference with the quality of the signal. DEEGO Cat 7 utilizes soft PVC for the cover to promote environmental safety. It is approved for low toxicity, low smoke, high flame retardant, and low corrosion. DEEGO is a great choice for your office or home. It provides flawless premium connectivity to your laptop/PC and components in the network including routers, printers, VoIP phones, Xbox 360, security camera, and Xbox One. This cable features ultra slim technology that saves space and avoids entanglement. You can also conceal the cable in any part of the house using the 20 cable clips to save space. It also features a reusable & adjustable Velcro cable strap for easy storage and organization. DEEGO Cat 7 supports 10Gbps with voice & 600 MHz, data and video. This cable provides awesome gaming, download and movie experience. To prevent crosstalk, interference and noise, DEEGO Cat 7 Cable is built of four pair twisted and shielded wires. Experience wonderful gaming in a universal LAN connection. The compatible connection links your computers and peripherals perfectly to the LAN. RJ45 connectors with gold plating and a durable PVC ensures accurate data transfer, protection and rust-free connectivity. The product package includes 50 ft. Flat White/Black Ethernet Cable and 20 cable clips. DEEGO is very flexible for passing under the door or drawer. The dimensions of this cable are 10 x 0.6 x 8.2 inches and the weight is 14.1 ounces. Upgrade your gaming connectivity in 2019 with DEEGO Ethernet Cable. Place your order on Amazon now. 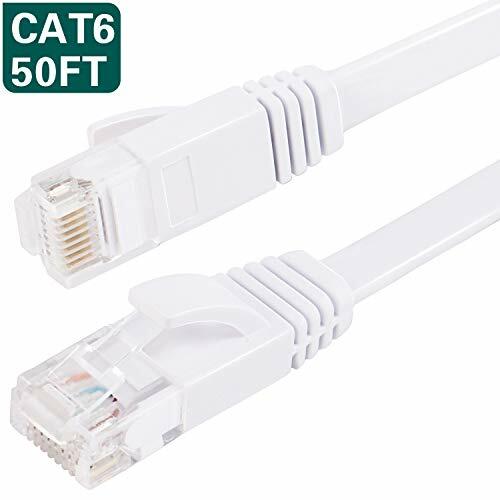 CMPLE Cat5e Ethernet Cable is ideal for direct connection among computers in a network or patch panels. The top-notch stranded pair of wire supports data transfers to 350 MHz and protects against crosstalk, and radio & electrical interference. CMPLE Cat5e comprises of copper clad aluminium (CCA) stranded 568B wire with a PVC jacket and RJ45 plug ends. It supports a bandwidth of 1 Gbps Ethernet. You will have an easy connection on servers, laptops, game consoles, smart TVs, and all peripherals within the network. Exceptional strain relief and gold-plated keeps the cable flexible while the gold-plated contacts prevent the loss of signal by creating a barrier against corrosion or oxidation. The package includes 1 white ethernet patch cable 50 feet weighing 8.8 ounces with dimensions 7.4 x 6.7 x 1.5. Give your gaming network a facelift with CMPLE Cat5e Ethernet Cable. This is a quality product from the Amazon. To buy a suitable cable for gaming you may consider a few tips below. Copper wires produce the best cables because of higher conductivity compared to other metals like aluminium. It is also stronger, more ductile and malleable thus suitable for use in all environments especially in limited spaces where the cable should not be conspicuous. A conductor gauge of 24 AWG will give you impressive results for live gaming. The gold plating provides a vital shield against corrosion, wear and any external interruption to keep data flowing consistently. The RJ45 jack is a popular universal connector that fits in all LAN. A good cable should exhibit ultra-fast transmission with little interference. The higher the bandwidth the more powerful the Ethernet connection. With more components in your network, you need a stronger Ethernet cable to serve the network accordingly. Uninterrupted connectivity guarantees optimum performance of a LAN. A cable that offers universal connectivity is preferable in a network where you connect diverse components. Your Ethernet cable should be compatible with the devices in the network. RJ45 connector works flawlessly with most peripheral devices resulting in a smooth connection. The efficiency of a network is dependent on speed. For Cat5 and above Ethernet cables, speeds range from 1Gbps to 10 Gbps. The higher the speed the more efficient the transmission. Purchase a cable with the highest speed to improve the quality of your indoor gaming. Find out the average speed of your internet service provider alongside your streaming needs. The length of the cable is another important factor to consider when you go to buy a cable. This may be determined by the distance covered by your LAN connection. The more the rooms involved in the network the longer the distance. An excessively long cable for a short distance is a waste of resources and much of its surface is exposed to wear and interference than a good fit in terms of distance. Some brands sell Ethernet cables in packages of fixed length such as 50 feet or 100 feet. Other brands give room for your choice of length. It is advisable to always buy products that have the right certification and global standards of use. Check for ISO/IEC 11801 and TIA/EIA Compliance for the approved quality. The Fluke Test and other quality assurance procedures make sure that you not only get a cable to use in the network but you also handle safe material that does not risk your health. 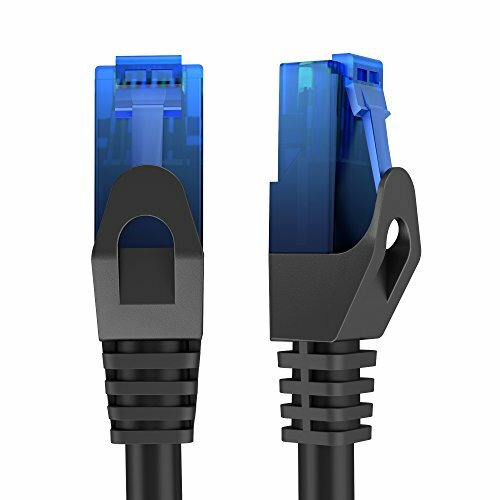 What is the difference between Cat7 and Cat5e cable? 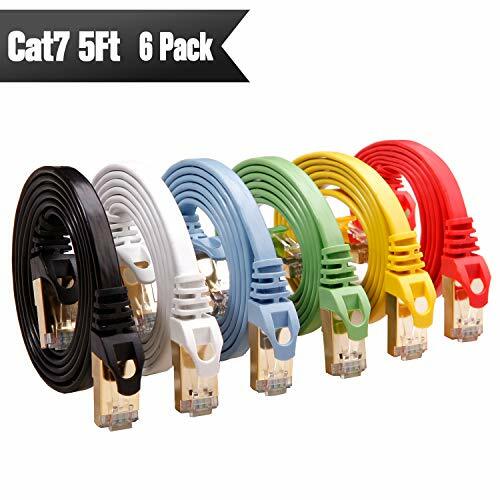 Cat7 is the latest advanced model of Ethernet cables that carry a more powerful signal hence better output. It handles with ultra-fast speeds up to 10 Gbps. On the other hand, Cat5e cable is an earlier less powerful version of Ethernet cable. The merit of upgrading is that the latest model will also serve the devices with the connectivity of earlier models of peripherals. Cat7 applies the recent technology, is more flexible and easy to use. Yes. There is a specific warranty status for a particular product ranging from one year to a lifetime. All the cables on sale are world class hence a long warranty duration because the quality is undoubtedly awesome. Will the signal be secure and clear? Certainly. This model has been designed to handle the common problem of noise, crosstalk, and physical & electrical interference. The gold plated contacts shield the signal by preventing oxidation or corrosion of the cable. Therefore, the interior of the cable, which is the vital channel of data transmission is absolutely secure. Live streams when gaming require uninterrupted High Definition (HD) images and motion pictures in a consistent flow. Which models require an upgrade? I have used Cat5e for a few months now. In fact, you need an upgrade. The latest model is Cat7. It employs the recent technology which is data intensive and very flexible for use along squeezed cross-sections in any room. The anti-wear and anti-corrosion modifications ensure a longer lifespan for your gaming cable. Also, the new computer and media hardware and software require updated Ethernet cables for perfect compatibility that will promote maximum performance. Can I get a cheaper option? I think quality and purpose comes first. Cheap may become expensive when it fails you prompting frequent replacements. Incompatible gadgetry risks the functionality of your network components. It is important to buy a suitable cable and that will give you valuable gaming services. Ethernet cable is one of the requirements in a LAN network and you need this connection for a gaming encounter. The best Ethernet cable for gaming entails specifications that are at par with the latest technology. There are numerous brands of Ethernet cables in the market and perhaps you have also been using an option within your reach. It is of the essence to consider quality guided by important features and your needs. Not every cable will support the performance of your network. For instance, there are cables that can only handle speeds of 100 Mbps whereas others such as Mediabridge support lightning speeds of up to 10 Gbps. The review of the 7 best sellers in the Amazon present to you a variety of the top picks and the particular details of each brand guides you to make the most appropriate choice. The shopping clues discussed also give you much insight as you shop for a contemporary cable. The Amazon shelves are flooded with an assortment of world-class Ethernet cable brands. You can also be sure to get all the electronics, appliances, furniture, clothing, and whichever genre of commodities at affordable prices and latest models. Product standard is a priority in the Amazon and this has made this online partner the hub and depot of the excellent products. Make a paradigm shift in your gaming today with the best Ethernet cable. Amazon leads online retail, others follow!